8 ports should be enough for everyone - but 24 ports are so much cooler. The more, the better. I’ve decided again for minimum investment - 68 EUR for 24 bidirectional Gigabit isn’t that bad. It’s a TP-Link L-SG1024. So I’ve ripped it open (you expected that, right?). To make a long story short: This switch isn’t hackable. 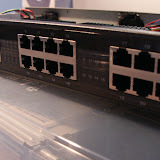 It uses a Marvell Prestera-DX switch (with external QPHYs), and this is a strictly unmanaged switch solution. Sorry.